Generally, it is required to add widgets (different from sidebar widgets) in specific page to simplify jobs. Suppose you have to show RSS feeds in specific wordpress page then it is better to add the RSS widget in the page to make life easier. Widget is placed only in sidebar. Can sidebar be customized as per custom layout? You can create sidebars as per your requirement, place them in the page where you want and add different widgets in different sidebar. For this, Open function.php in your active theme. If it calls register_sidebar function for existing sidebar then call it again to create new sidebar for the page. Then I added register_sidebar function again for new sidebar. Note 1: You need to give index of new sidebar. Suppose your theme has already 3 sidebar and you have registered for new sidebar then put dynamic_sidebar(4) instead of dynamic_sidebar(2). Note 3: You can create multiple sidebars and call in same manner by changing index. 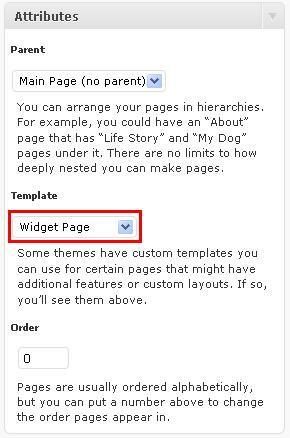 Select “Widget Page” Template in attributes area and publish it. Drag widgets to the sidebar, fill options and save it. Open the page in browser and enjoy it. Nice and simple! Have been looking, but others are not as well explained. Just a question.. How can I Specify width for newly created sidebar ?? oh,my god ! Thant's good article. We like reading article ! We will always come come here reading. thanks a lot.